Outgoing postcard US-3139451 to Malaysia was a vintage card showing the Union Terminal Tower, a 52-story landmark skyscraper located on Public Square in downtown Cleveland, Ohio. At 235 meters or 771 feet, it was the fourth-tallest building in the world when it was officially dedicated on June 28, 1930 during the skyscraper-building boom. The 4.4-acre Public Square was laid out in the original plan of the city conceived by its founder General Moses Cleveland in 1796. 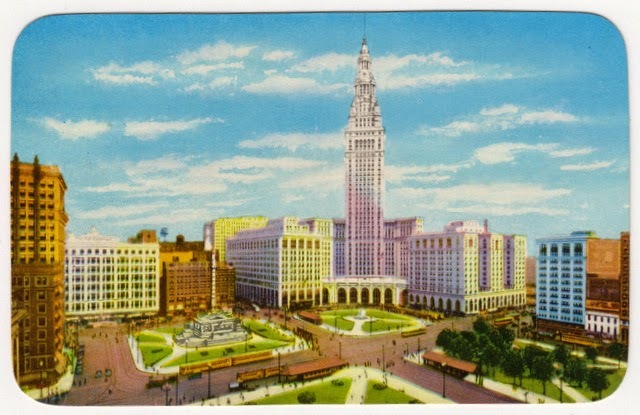 With the Union Terminal Tower on the southwest corner, the Soldiers and Sailors Monument and a Civil War Memorial can be seen in the center of the southeast section of the square on the postcard.